parenting/adoption experiences. Created on the road with my son. Zine Goal: quarter size, hospital b&w, tuberculosis art and text, 16 pages. favourite zine making supplies, and a snacks. this event is free! it in. Ob la di. My body wont let me stay up late. Zine Goal: finish the 24-page zine this year! story of whatever happens to be in my head on the 31st. Zine Goal: To confront the blank page! Zine Goal: kickstart my art. months but have never actually started. moved far, far away from all that. Zine Goal: Make a zine dedicated to my friends. get on track with making zines! Zine Goal: To make a one-shot zine of letters to people. Zine Goal: My usual zine, SYNDICATE PRODUCT, is a compilation zine with a clean, sparse, stylized layout, digest-sized. For 24HZT, I want to make a zine that is 100% my content, add some collages, and do less on the computer. Want to do 1/4-legal sized. Was going to handwrite it all, but cramp-y hands and age prevent that. Still may do some handwriting in the collages. Zine Goal: To not make any spelling mistakes. sequel to my mini zine from 2008 “tick tock biological clock”! Zine Goal: A juicy, quirky zine about creativity. i’m ready to put one out!! Zine Goal: To just DO it (well)- always, be dada! Zine Goal: To make each page count and not judge my work too harshly! in the 24 hours that is given to me before the end of July. Zine Goal: To sneakily superimpose a picture of a kitten into my zine. can draw some pictures in time. 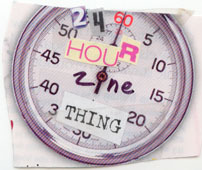 Zine Goal: Make a 24 page zine in 24 hours! Zine Goal: 1/4 size, 24 pages, no rules. regualr zine I can be proud of. Zine Goal: Clashing patterns, shapes, colors, and text. Zine Goal: 1/4 page with lots of drawings! Zine Goal: Test my creativity…come up with something fresh and new. Zine Goal: Paper, words, copies, staples, postage. Zine Goal: probably something quarter-zized on alcohol. Zine Goal: I’m new to zines but I like deadlines so this is perfect. Zine Goal: To actually get something done! for years, and now it’s time to get to it! Zine Goal: Fill with drawings. Complete it. Send it. a minizine to go with it as well. help with both of those things! and also to be part of a cool zine project! working at Beam Camp in Strafford, NH. experience as an unemployed librarian at ALA.
ideas in place I guess I’ll surprise myself on the big day. years from now I will still want to pick up and flip through. pages, at least end up with a finished zine!! Zine Goal: Perzine, maybe 1/4 sized.